﻿﻿This easel is great!for travel. (students, teachers, plein air artist, etc.. ) This is even a great studio easel. I would recommend it to anyone! Basic Mountain Mix is 35% Prussian Blue, 50% Ivory Black, and 15% Alizarin Crimson. Classic Mountain Mix 30% Prussian Blue, 35% Ivory Black, 25% Alizarin Crimson, and 10% Titanium White. 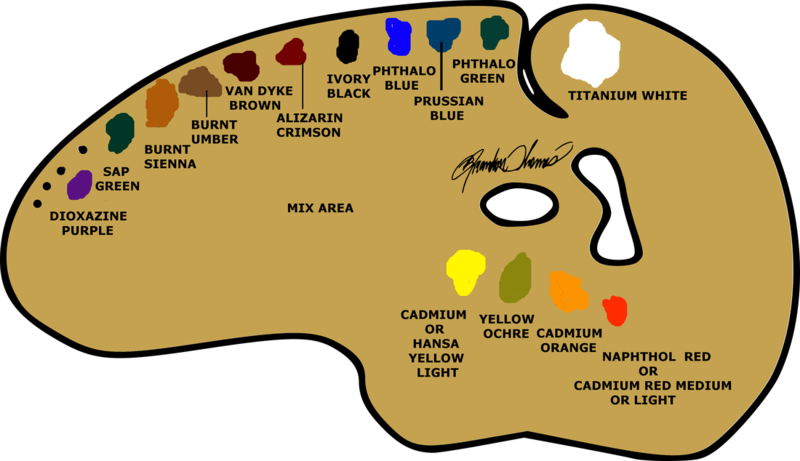 How to Varnish Your Painting! Putting a finish on your painting will protect it from the elements. Products made specifically for this purpose are available at art stores. Most suggest a curing period of between 6-12 months before application. Follow the product directions or have it professionally done. ﻿There are as many different ways to sign your painting as there are painters. And more than likely your signature will evolve over time. Some folks use their initials, some use pen names, others use their full name. The choice is yours. When you sign is also your choice. You can sign it when you are finished painting or you can wait till it's dry. I do suggest that you place the date and the name of the painting on the back side of the frame using a sharpie. That way you will have a good reference later on. Chances are, if you ever paint a painting that you are completely satisfied with, your painting career is over. Each painting is a learning experience, increasing both your knowledge and skill. I paint the same painting many times. Sometimes they have been painted in the classroom, but many are done in preparation for the classroom. If a particular painting stands out as something I want to keep I set it aside. The rest I will usually paint over. I use my palette Knife and scrap as much paint as I can off the canvas then I use a shop towel (blue paper towels) dipped in paint thinner then wipe the whole canvas (YOUR CANVAS WILL LOOK A LITTLE GREEN) after I cleaned the all the paint off let it dry and your ready to go again! Don't worry about the green off color, it could change the effect you would get from a clean crisp canvas but you will be able to reuse the canvas. The method we use is called wet-on-wet. We use extra thick paints and they dry slowly. At the end of class you will be taking home a completed painting that is still wet. Several methods are available for transporting a wet canvas. I recommend to bring your own table top easel to class. You may use the teachers at the class but you will use this to carry your wet painting home. 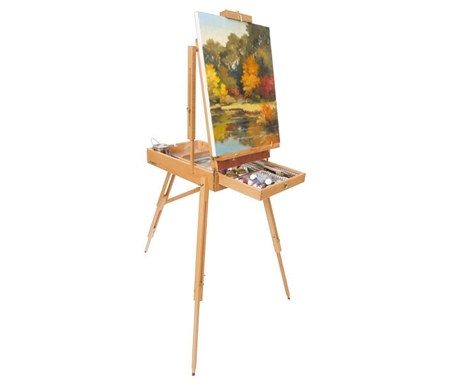 Make sure the table top easel you bring has a canvas holder on top so you can lock it down. After the class put your wet painting on the easel, lock it down and go! You can use an extra large palette or purchase palette paper. However a great substitute is freezer paper that is plastic coated on one side. Also known as "fish paper" it can be cut to a generous size. <> Clean up is easy as you just roll it up and throw it away. We recommend Brandon's palette because the palette tone is perfect for mixing colors. Here is two photos of how Brandon loads his palette. It is important to load your palette the same ever time so you know where your colors are. Brandon loads his in the same spot almost ever time. Brandon moves his yellow / light colors if he has a full palette. See below.